Christmas tree has become a tradition for many years that awaited Americans to celebrating Christmas and marks the start of holiday season. In Washington DC, Christmas tree lighting ceremony performed every year in a field in front of the White House attended by thousands of Americans. Christmas tree ceremony in yard of White House began in 1923, and the 30th American President, Calvin Coolidge, was the first president who did the tradition. One tradition which entering its 89th year is the lighting of the Christmas tree on the Ellipse field, in front of the White House in Washington DC, capital of United States. This is arguably the top Christmas tree lighting event nationwide who traditionally performed by the United States president and his family. Christmas trees, colorful lighting, and other Christmas decorations enliven the atmosphere in the cities of United States in December. Christmas tree in the White House have different characteristics in each years. 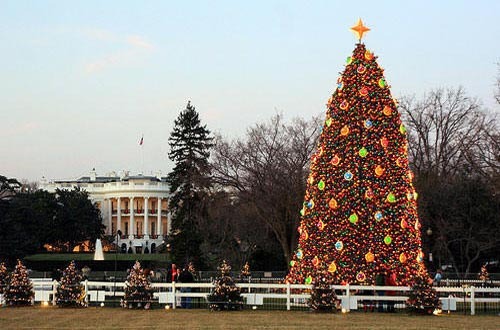 In 2010, the Christmas tree as high as 42 feet planted on the grassy area in front of the White House or the field known as the Ellipse. 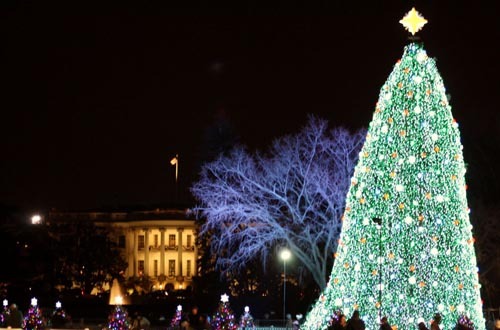 More than 25,000 bulb decorate the White House’s Christmas tree and very beautiful and amazing. And this year’s White House Christmas tree decorations are still not clear because there are no designers who claim to be the decorator. Perhaps this was intentional because to make a surprise for all people of the United States.